The craze of Instant Pot has started in the last few years. A lot of people all around the world use Instant Pot to cook the food instantly. For all the people who haven’t yet used the instant pot, you must have heard about it somewhere. Using Instant Pot, you can cook delicious recipes in no time. The cooker can help you to cook a wide variety of foods. There are a large number of recipes you can cook in an Instapot. But before using Instant Pot you should check Instapot Reviews. Are you searching for new recipes to cook in Instapot? Or you are using Instapot for the first time and don’t know with which recipe to start, then you have reached the right place. There are a large number of apps available in the market, which can be useful. For now, we will provide you the list of some of the most amazing apps. The app provides you wide range of healthy and delicious recipes on consideration of their partners and recommended cookbooks. Besides this, the app permits you to sort dishes in various different ways. You can search recipes by title, author, name, and date. You can also add recipes you like in favorites. The app consists of more than 450 recipes. You can search it using different filters. Copy Me That can be the best source to search for new recipes. Firstly, you have to create an account before using the app. The most amazing feature of Copy Me That is you can sync it various devices, so you never lose a recipe, despite it is no longer available at that place. You can search new recipes via tags, simple search, or add your own words. This is another app by Instant Pot Community. This app not only provides recipes but also works well with Bluetooth, hence you can control and monitor the cooker easily. The app offers a large variety of recipes which cover an amazing combination of food materials, and techniques. Moreover, the app also provides an option to write recipes using six provided commands, all these commands can be helpful to prepare something delicious. When your recipe is tested and proven, you will be able to share it with others. This is another awesome recipe app, which is not only meant for Instapot but provides amazing healthy meals. It provides a list of thousands of recipes which you can sort as per your dietary requirements and types. The app provides full video to cook the whole recipe. Using this app, you can instantly search for recipes, how-to-videos, and in-depth articles, etc. 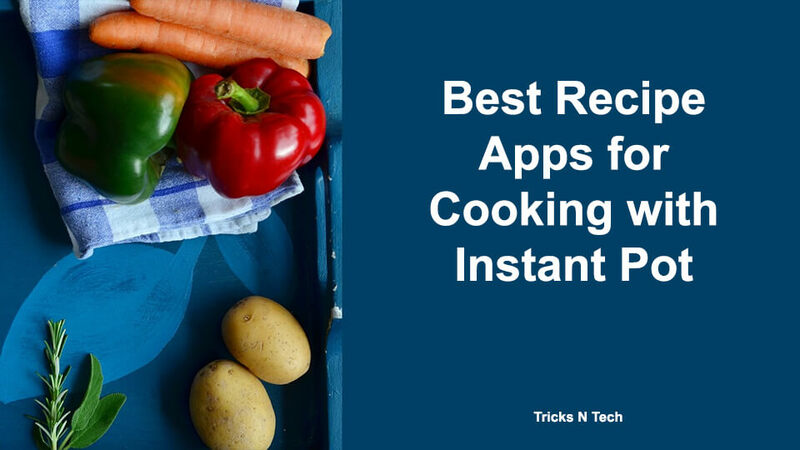 We hope that you liked our list of Best Recipe apps for Cooking with your Instant Pot. If you found this useful, then don’t forget to share it with your friends.